Seam bowler Clint McKay hopes to see more Australians in the Leicestershire dressing room next year. Australia-born Angus Robson is already at Grace Road, while batsman Mark Cosgrove has been linked to the Division Two club, who failed to win a single Championship match this summer. "The more Australians you get in the dressing room the better," said McKay. "Walking into a new dressing room can be daunting so seeing a familiar face to help settle in would be great." Leicestershire have to rebuild their squad after captain Josh Cobb, batsmen Greg Smith and Michael Thornely, all-rounder Shiv Thakor and pacemen Nathan Buck and Anthony Ireland left the club at the end of this summer. McKay, who has played 59 one-day internationals for Australia, has agreed a deal to join the Foxes for the 2015 season and believes his experience can help the younger players coming into the side. "I am an overseas bowler and with a young squad next year, it is great to have some experience and be able to share that with the younger bowlers," the 31-year-old told BBC Radio Leicester. "I spoke with a couple of other counties but Leicester, with the links of Andrew MacDonald and Brad Hodge, they both gave me a great insight into how the county club works and the way they are looking to move forward as well. "It is an exciting time and hopefully I can come over and make a difference, both on and off the field." 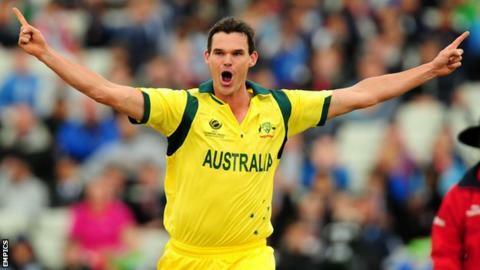 Hear the full interview with Clint McKay on BBC Radio Leicester on Friday from 18:30 BST.